Ultimate Sound Control is a free application for Android that gives you better control over system sounds on devices running Android. All Android versions come with some form of sound management. You may change the global volume for instance, select individual volume settings for ring, alarm and media, or change sounds for specific events. Depending on the manufacturer of the device, you may get even more controls, for instance to turn off the sound the camera makes when you use it. But, not all manufacturers add these to their devices, and even those that do, don't provide you with all sound settings Android supports. Ultimate Sound Control requires root, just to get this out of the way. It won't work at all if you have not rooted your device. Good news is that it requires no special permissions, and that it is compatible with the majority of Android devices. Bad news, that it has not been updated since 2013. While that suggests the application has been abandoned by its author, it worked just fine on an Android 5.1.1 device. When you run the application after giving it root permissions, two main areas are displayed to you. The top lists volume control sliders which provide you with the means to set volumes for media, ring & notification, call, alarm and system individually. More interesting than those are the individual sounds displayed beneath those sliders. They enable you to turn off specific sounds on the device without affecting the volumes you set previously. If you don't want a sound when you take a photo or video, when you unlock the phone, or send a message, then you may do so there. While you may switch the device to silent mode for pretty much the same effect, it may not work for all sounds. Plus, if you want sounds with the exception of a few, you may only do so using an app like Ultimate Sound Control for Android. The changes take effect after a reboot of the device, and the app informs you about that so that you know that this is the case. Below is a video that reviews the application's functionality as well. 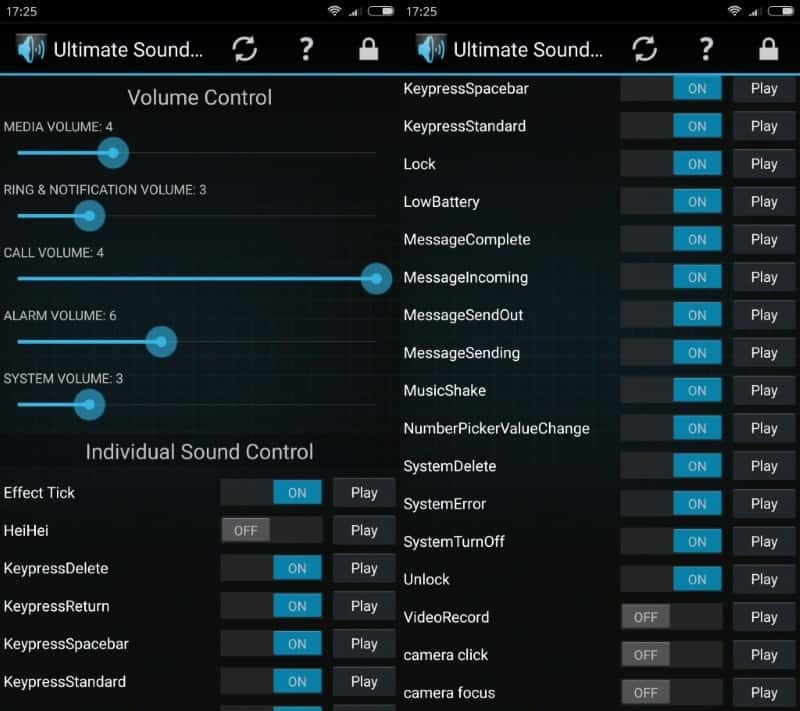 Ultimate Sound Control is an easy to use application that requires no extra permissions. Its main purpose is to turn off certain sounds on Android devices without switching the device to silent mode. The feature is especially useful on devices that offer little sound control options, but may be useful on others as well thanks to its impressive list of supported sounds. A Pro version was available at one point in time, but it seems to have been pulled. It allowed you to change the sound file of the events and actions supported by the app. Is there an app to ADD sounds to Android like Windows has for various events? It does seem like this is a Pro version feature. It looks like the pro version does still exist; there is a restriction for Google Play store to show it for select countries. is there a way to overwrite the default bluetooth sound volume ? I want mine to be at max, coz when ever you play over BT, the sound volume is handled by the BT device anyway. Now i have to turn my car volume or mobile speaker volume way up to have a decent level. especially in the car this is bad. When i switch to radio the volume us way to hard, as it had to compensate for the BT volume.